My daughter's first year in Girl Scouts, the troop leaders suggested these Thank You photos to hand out with cookie orders. The troop leaders helped the girls set up the letters on the floor and then they all took their turn as the "Y" on the floor. I added the "for supporting Girl Scouts!" in Photoshop. For year two, the troop didn't do anything, so we made up our own. For year three, we had a had time deciding. 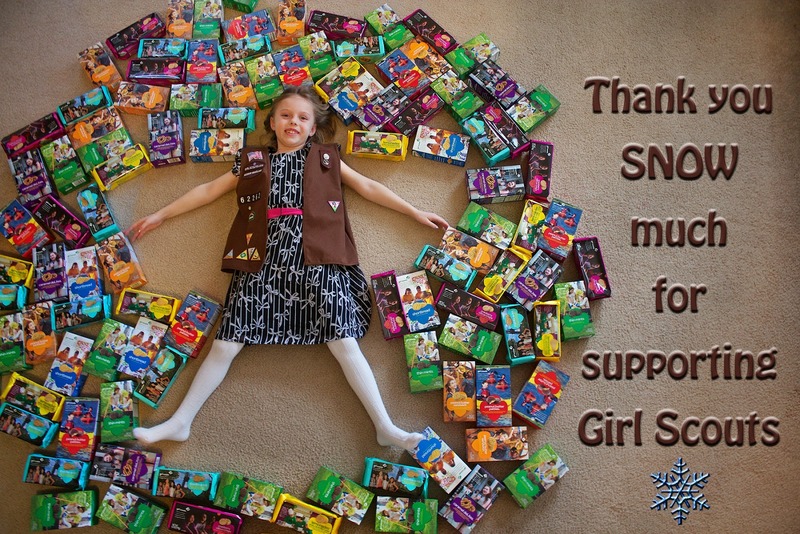 My daughter wanted to just hold a box of Thanks-a-Lots and have the text say "Thanks-a-lot for supporting Girl Scouts!" I thought that sounded boring, so we kept the text and instead of one box, made her hold a big pile of cookies with Thanks-a-Lots on top. 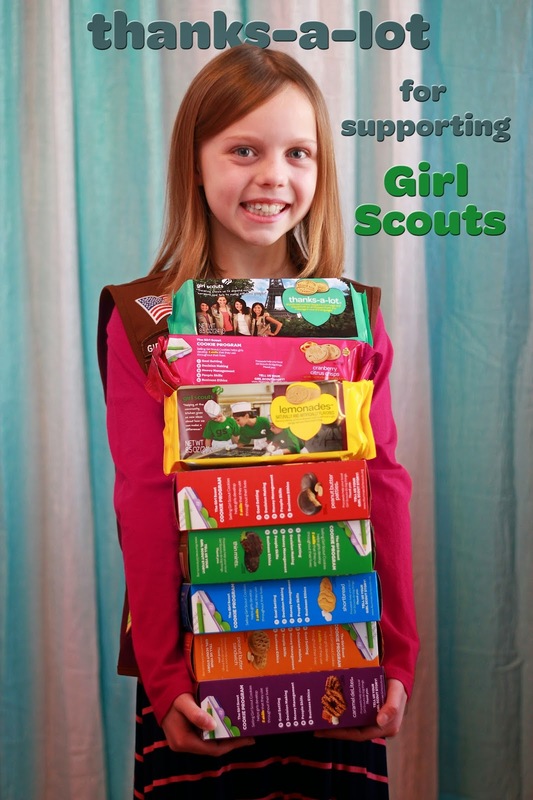 I hope our ideas help your Girl Scout grow her cookie business! If you have a great thank you photo idea, please share it in the comments. 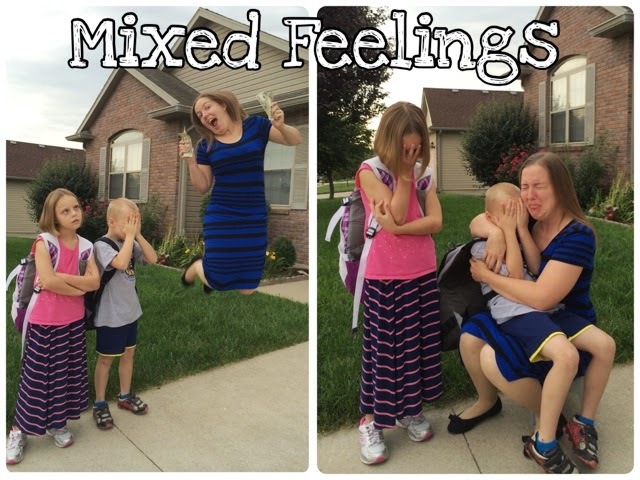 First day of Third Grade for one and first day of Kindergarten for the other. I'm really excited to be done paying for day care. And a little sad that my babies are growing up. 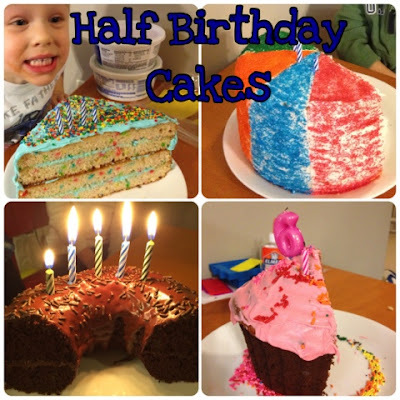 I think it was when my daughter was three and a half years old, we decided to start celebrating half birthdays. By that point, she was making sure everyone knew she was two and a half versus three versus three AND A HALF. So, we decided to start a family tradition of marking the occasion. We make a half cake and sing "Happy Half Birthday to you..." and blow out # and a half candles. No presents. As much as my daughter begs, we don't give gifts. First of all, I usually make a whole cake and then just cut it in half. And for the candles, we just shove one of them farther down into the cake. So, here are a few of the half birthday cakes I have made over the years for my son and daughter. The Giant Cupcake has made several appearances over the years on half birthdays. I have also made a round or square layer cake and then cut it in half and stacked it up to make a half cake that is twice as tall. My son likes sprinkles. Can you tell? My daughter requested a cheesecake one year. And the Giant Chocolate Donut is always popular. I have a confession to make. I spend too much time on Pinterest. 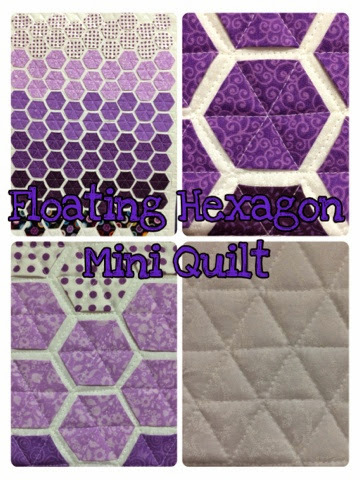 One day while exploring, I came across this machine stitched hexagon mini quilt. I thought it was gorgeous, so I pinned it. 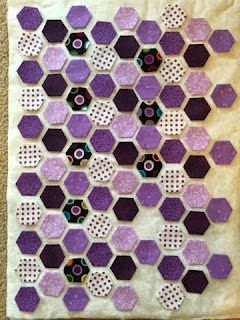 I also took the time shortly thereafter to read the whole post and watch the hexagon making tutorial that she referenced. 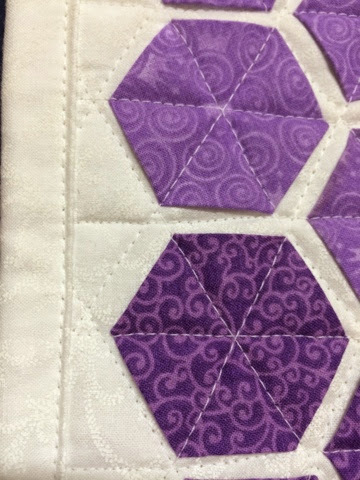 And looked at her post about the holiday mini quilt she made. And I was hooked. 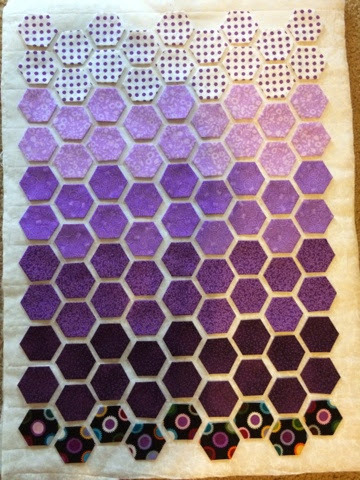 Instead of making the quilt that I originally saw posted, I ended up with something a little more like the second one. I went through my piles of scraps and found six variations of purple fabric that I've used mostly for things for my daughter (like this quillow). I decided this would be a mini quilt for my daughter's American Girl style dolls. 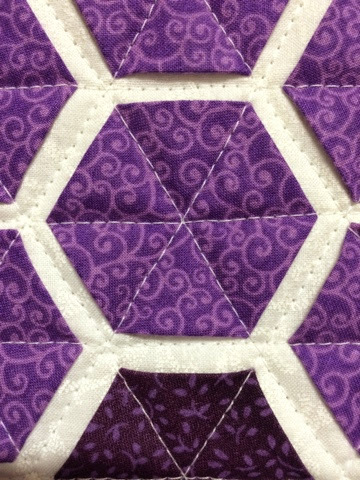 Then, I got to work sewing hexagons. 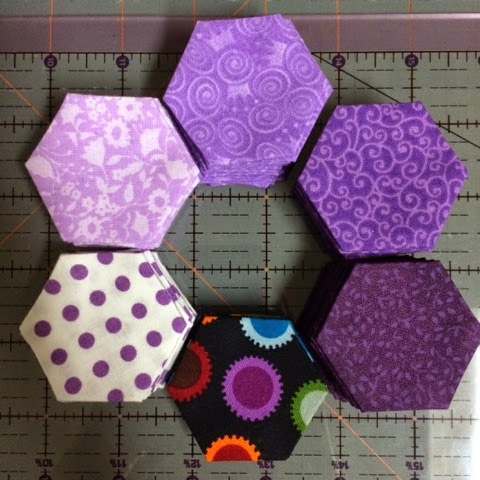 I wanted to spend as little money as possible on this project, so I printed my own hexagon templates on card stock and cut them out myself. I got the template here. 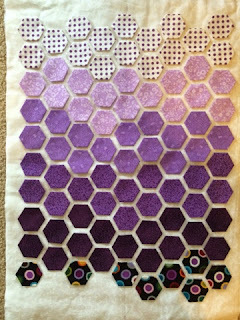 I made 24, then ironed them, took out the templates, then made 24 more, and kept going. 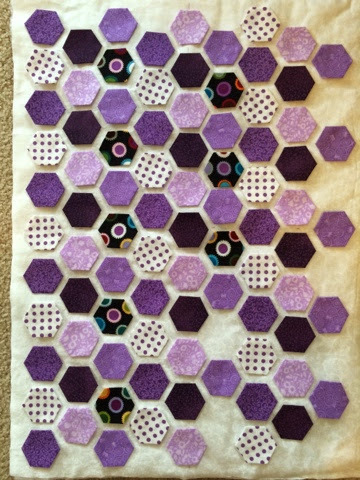 I found out later that I needed 99 total hexagons. I did 18 in each of five different colors and 9 in a sixth color. 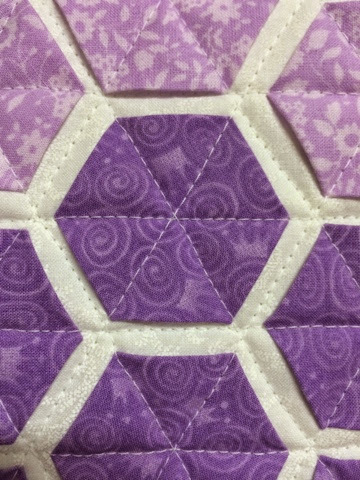 I did have to buy the backing fabric and I let my daughter pick it out. 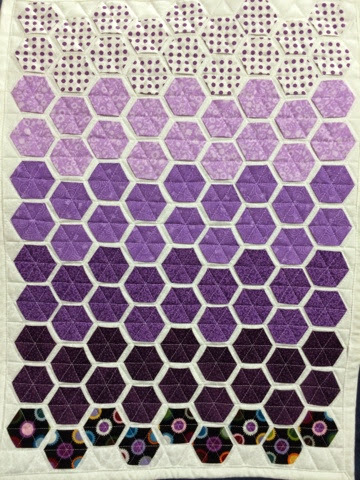 I wanted white so the hexagons would "pop". She picked a white with a bit of a faint design on it. I cut two pieces of the white fabric and one piece of batting at 18" x 25". I used basting spray (for the first time) to hold the layers together. 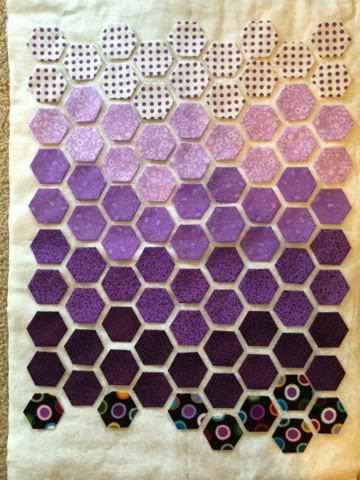 I tried a few different designs for the layout of the hexagons. We liked this one best so I ran with it. Light to dark - the winner! 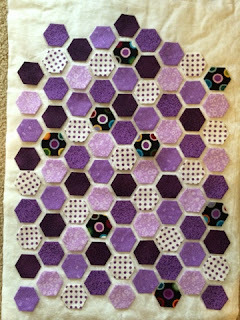 Next up was quilting. I followed the instructions on the mini quilt tutorial. And I love how it turned out! 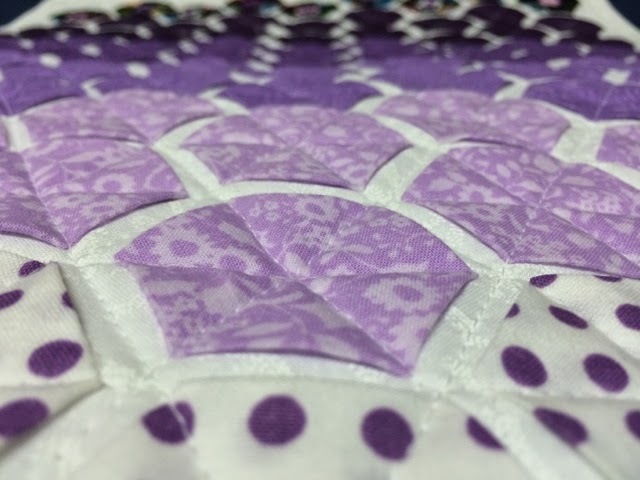 Then I machine bound the quilt. After making 99 hexagons by hand, I didn't want to hand stitch the binding. And that's it! 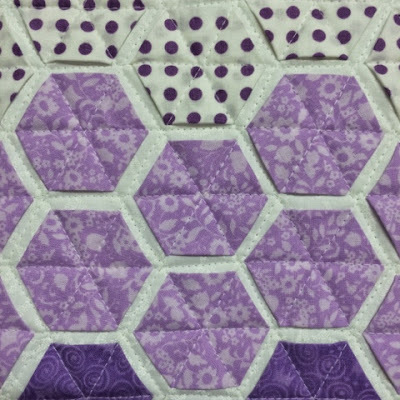 The mini quilt is done! This weekend was my daughter's First Communion. We sketched up a cake idea together and this is how it turned out. I used white store-bought icing and did a crumb coat. Then I made a batch of white homemade fondant and rolled it out to cover the whole cake. 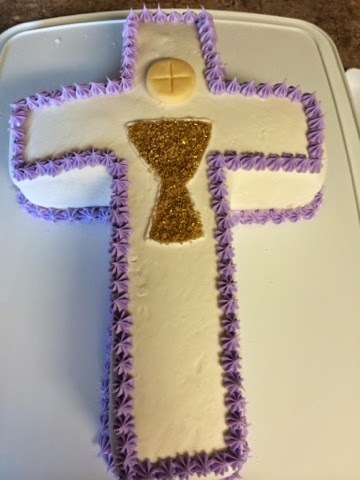 I tinted a can of store-bought icing light purple and piped tiny flowers around the top edge of the cross to define the edges. I then piped slightly larger flowers around the bottom to hide the fondant edge. I cut a small circle out of Candy Clay for the host and used a toothpick to draw a cross. I used the toothpick to lightly draw a chalice outline in the fondant, then I piped the outline with white icing, and filled it in with gold sprinkles. Cake is done! 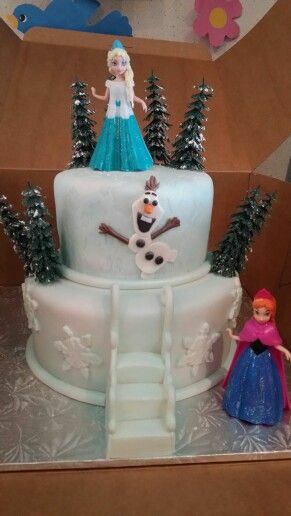 It looked great and tasted great and my daughter loved it. 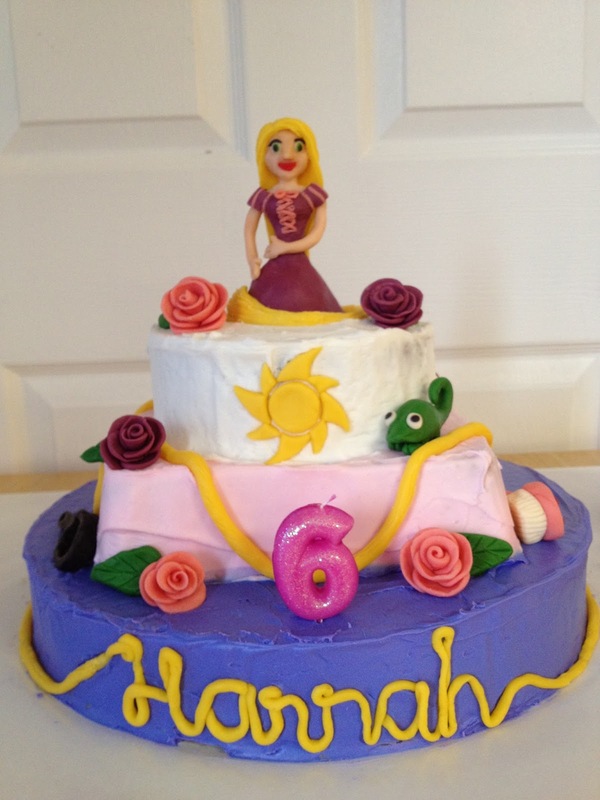 I've been using Candy Clay for quite a while for edible cake decorations. The recipe on Wilton's site has you use an entire bag of Candy Melts. (Melt one 12oz package of Candy Melts according to package directions, then stir in 1/4 cup light corn syrup until smooth.) That makes a ton of candy clay and I never need that much. So, a while back, I did the math to scale down the recipe. If you want a smaller amount, use one teaspoon of corn syrup for every ten candy melt discs. (This only applies to Wilton brand Candy Melts. Other brands may have different sized pieces.) The instructions Wilton provides are easy to follow - but basically, it is melt the candy melts (I use microwave method), stir in the corn syrup, then spread out on a plate or wax paper and let it cool overnight. When you are ready to use it, you knead it a little at a time to soften it up and you are ready to go. If it starts getting too soft, put it in the refrigerator (or other cool location) to firm up a bit. 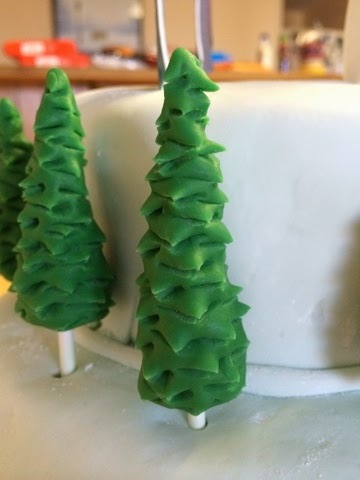 For the tree above, I shaped the prepared candy clay into a cone shape and then stuck a lollipop stick in. I used kitchen scissors to make small snips all the way around. When done, I stuck them into the cake evenly around the bottom layer. My kids and party guests seem to always argue over who gets the Candy Clay pieces. I think they like it more than the cake itself. Try it out and see if you like it. Let me know how it turns out for you. The first thing I did was search Pinterest for ideas. 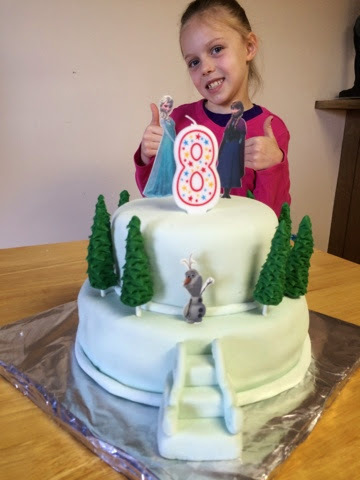 We found this image of a cake and my daughter gave me the go-ahead. She chose two different flavors of boxed cake mix (because I have yet to attempt baking a cake from scratch) - blue velvet and pink lemonade. I baked them according to package directions, leveled them, stacked them, and crumb-coated them in store-bought icing. Somewhere along the line, I decided this cake would be the perfect opportunity to finally try using fondant, and homemade fondant at that. I followed the instructions for Homemade Fondant found on Johanna's blog My Crazy Blessed Life. It was easy to make - just marshmallows, powdered sugar, and water. I added a bit of blue gel food coloring at the end and kneaded it in to make a marbled effect. However, after I rolled it out nice and thin and got ready to pick it up to gracefully drape over the cake, it was hard-core stuck to the counter. So I had to knead it some more before rolling again (with way more powdered sugar on the counter this time) and my marbling was gone. I did the bottom tier by itself first, then did the top, and then stacked them. I covered the rough edges with a fondant rope. 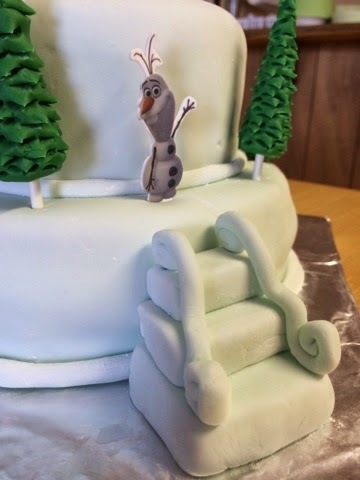 The ice/snow steps in front were blocks of fondant and a fondant rope railing held in place at the top and bottom with a cut toothpick. Now for the other decorations... I made the trees out of candy clay. 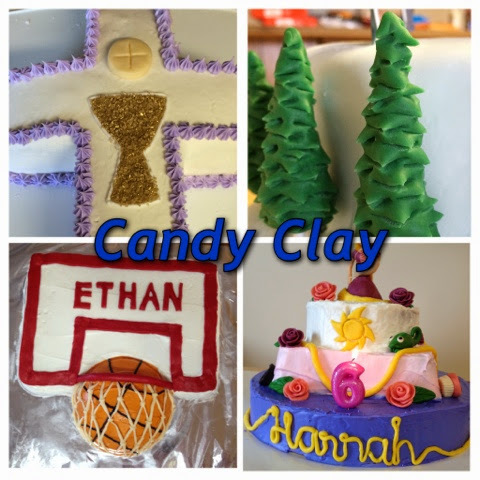 I've been using candy clay for quite a while for edible cake decorations. The recipe on Wilton's site has you use an entire bag of Candy Melts. That makes a ton of candy clay and I never need that much. So, a while back, I did the math to scale down the recipe. If you want a smaller amount, use one teaspoon of corn syrup for every ten candy melt discs. (This only applies to Wilton brand Candy Melts. Other brands may have different sized pieces.) 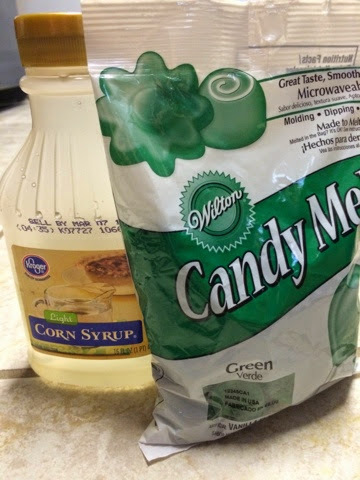 The instructions Wilton provides are easy to follow - but basically, it is melt the candy melts (I use microwave method), then stir in the corn syrup, then spread out on a plate or wax paper and let it cool overnight. 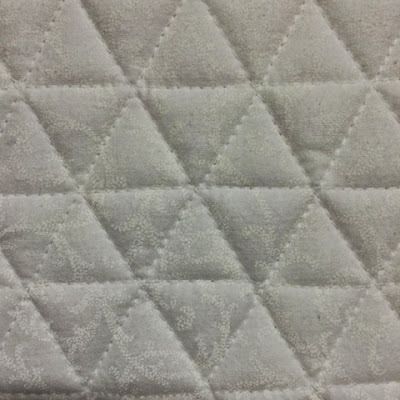 When you are ready to use it, you knead it a little at a time to soften it up and you are ready to go. I shaped the prepared candy clay into a cone shape and then stuck a lollipop stick in. I used kitchen scissors to make small snips all the way around. When done, I stuck them into the cake evenly around the bottom layer. Next up, I needed some Anna and Elsa and Olaf to actually make this look "Frozen" and to meet the approval of my daughter. This is where things got surprisingly complicated. 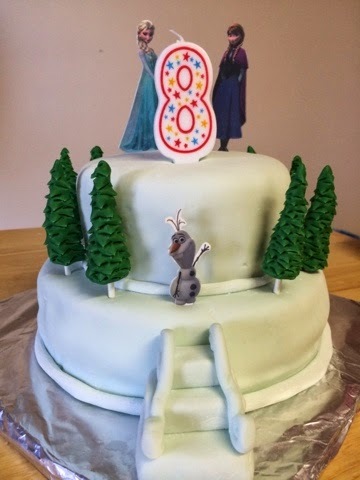 I planned to just go to Target or Wal-Mart and buy small Anna and Elsa toys to put on the cake like in the inspiration photo. Not so easy. I went to every store I could think of and couldn't find Elsa. I found Anna at a few stores, but the cheapest small Elsa I could find was included in a larger playset and cost around $40. 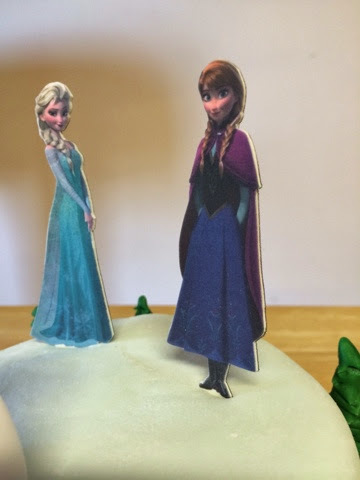 I love my daughter, but I am not spending that much on a cake topper. Sorry. I explored every option I could think of and settled on printing my own Shrinky Dinks. If you are not familiar with Shrinky Dinks, immediately stop reading this and go Google it and then buy some and have hours of fun. Just come back and finish reading this blog post eventually. 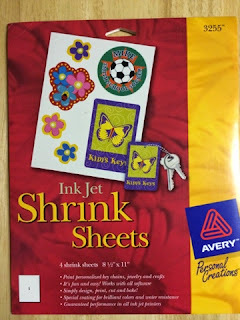 So, anyway, I found these printable "shrink sheets" forever ago and tucked them away. It looks like Avery maybe discontinued the product, but this product on Amazon looks like it might work. I found the images for Anna, Elsa, and Olaf on Google Images. I used Photoshop to get them all on one sheet of plastic and faded the color quite a bit. (You will want to experiment with this if the instructions don't give you specifics. If you leave the image full color, it will be really dark after you bake/shrink it.) I flipped the image and printed on the back also. Then I carefully cut out the characters leaving a spike at the bottom of each one under the feet. I baked them and stabbed them into the cake. 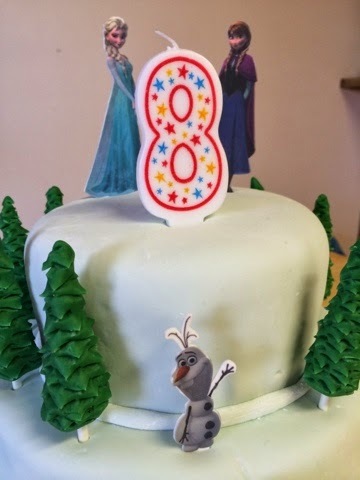 And since my daughter wanted an "8" candle, I stuck a toothpick into the bottom of the candle for extra support and cut out a small spot of fondant for the base and placed the candle. And with a finished cake, I had a very happy birthday girl. The End. And we all lived happily ever after. Right? Well, mostly. Just one thing I wanted to point out. This fondant is rather heavy. Everything worked out just fine, but you may be able to see the fondant on the bottom cake layer buckling a bit. Next time, I think I need to make a change or two to prevent this. -put some sort of support system in the bottom cake, dowels to hold up a base for the top cake, maybe.